“A foreward is not an afterward and also not a critical review. A foreward should open the door and point out the worth of a book so that it can be properly read and discussed. 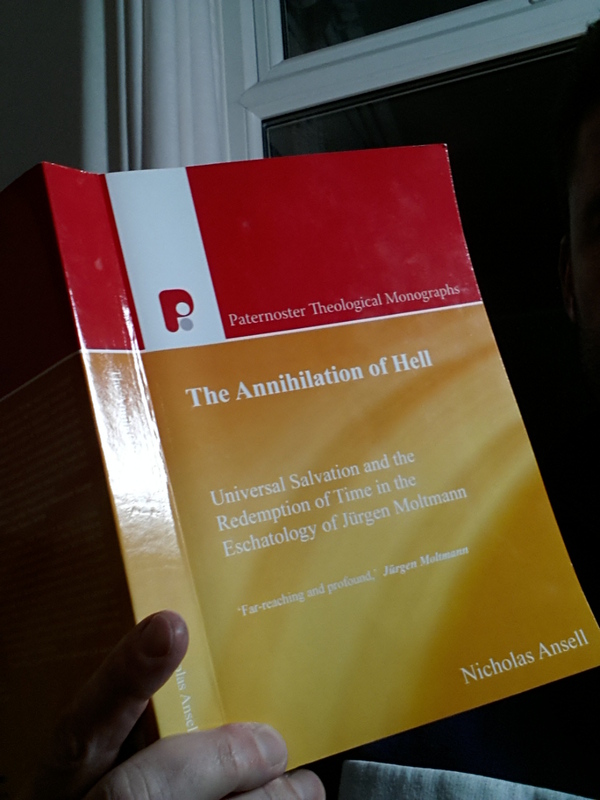 Nicholas Ansell’s book on The Annihilation of Hell and Universal Salvation is so far-reaching and profound a theological and philosophical work that a brief foreward can’t really do it justice. I’ll limit myself here to some biographical references, a few factual observations, and then an attempt to bring the theology of grace and the theology of faith into a theological dialogue. Any theology of grace will be oriented for God’s sake to the universal triumph of grace. Any theology of faith, however, will start from the human decision of faith and will result in the separation of believers from unbelievers. The universalism of salvation, on the one hand, and the particularism of faith on the other hand, are on two different levels. What is important is to closely connect them. Since my theology studies in Gottingen, where I wrote my dissertation in 1952 on the “hypothetical universalism” of the Calvinist theologian Moyse Amyraut, who taught at the theological Academy of Saumer in the 17th century, the idea of universalism has not let go of me. Amyraut’s idea, that the universal offer of grace is merely hypothetical until faith grasps it, I considered inadequate. Then I read Karl Barth’s new doctrine of election which appeared in his Church Dogmatics 2/2 and became convinced by his theology of the cross: On the cross of Christ, God took the guilt of sinners upon himself in order to give them his gift of grace. I continued to think through this dialectical universalism of salvation and found in Christ’s resurrection from the dead the beginning of the destruction of death and thereby “the annihilation of Hell.” Many Easter hymns in the German Lutheran hymnal celebrate the “destruction of Hell” by means of Christ’s descent into Hell and resurrection from Hell. In the Orthodox Easter liturgy, the destruction of Hell through Christ is also celebrated. Those who descend into Hell should “abandon all hope” according to Dante. But the Christ who descended into Hell is the “hope of the hopeless” (spes desperatis). I then took up an old desire of Karl Barth and Helmut Gollwitzer, namely to reform the doctrine of the LAst Judgment from the perspective of the crucified one who will come to judge the living and the dead. Here I had the Old Testament notion of “divine judging” for help. According to Psalm 96, God will come to judge the earth, and the earth will rejoice and the fields will make merry. In this instance, “judge” means raise up, set straight, heal, and bring to life. How could it be otherwise in the Christian anticipation of God’s Final Judgment and coming kingdom! In fact the so-called “Final Judgment” is penultimate; what is truly final is the new, eternal creation in which God becomes “all in all” (1 Cor 15:28). Jurgen Moltmann speaking at the BMS Catalyst Live event held in Reading, UK. This was the day I shook his hand and asked him how he was. His lecture there is unconnected to this blog post here. And in case you are wondering, he said he was fine and appreciated me asking him!